The Pacific War Online Encyclopedia: Rowell, Sydney F.
Sydney Rowell was one of the first students to attend Royal Military College, Duntroon, graduating as a cavalry officer just as the First World War was breaking out in Europe. He participated in the Gallipoli campaign, but poor health forced his return to Australia, where he held staff and training posts through the remainder of the war. Like his friend and classmate Cyril Clowes, and unlike many other Australian army veterans, he remained a professional officer between the wars. When war broke out, Rowell became chief of staff of I Australian Corps in the Middle East. His relations with Blamey soured, particularly after the debacle in Greece, with Rowell concluding that Blamey was incompetent and Blamey concluding that Rowell lacked stamina. Rowell commanded the Australians in New Guinea during much of the Kokoda campaign and battle of Milne Bay. He was severely (and likely unfairly) criticized by MacArthur for the performance of the Australian troops. 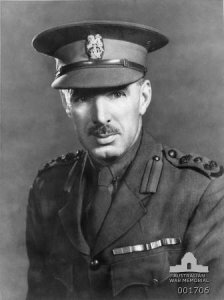 When Blamey arrived in Papua, Rowell had no desire to become his chief of staff, and the enmity between the two men erupted into a furious row that ended with Blamey threatening to reduce Rowell to his permanent rank of colonel. The Prime Minister intervened, and Rowell was shipped off to Cairo instead.